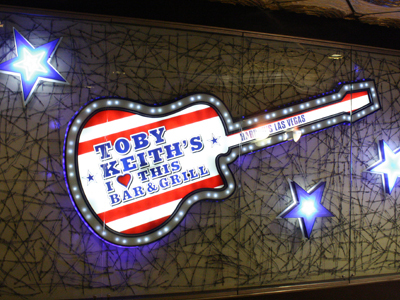 Toby Keith incorporates it all in I Love this Bar & Grill in Harrah’s Casino. Enjoy an All American dining experience in this red, white and blue designed restaurant sporting a large guitar-shaped bar for your drinking pleasure. Libations named after his country hits include “Whiskey Girl”, “Who’s Your Daddy” margarita and many more ”hits” offered at the fully-stocked bar. Feast on down-home cooking while viewing music videos and listening to live bands 5 nights a week. I Love This Bar & Grill is the place to let down your hair, kick up your heels, drink, sing and enjoy Vegas! If you’re up for a challenge, the Big Dog Daddy is 100 ounces of burger, bun, cheese, toppings, a pound of fries, a quart of beer and an order of fried Twinkies. Complete this meal all by yourself and you’ll earn a spot on the wall of fame at Toby Keith’s restaurant and take home a free custom Big Dog Daddy T-shirt. Free live music every night at 9 pm. Great music . Food was great! Love country music! Good price - great service - too much food! Was there on a Tuesday night for supper Had to wait for a waitress to wait on us for a over half hour. We spent over 2 hours there. Food was not good at all. Was really disappointed.